As part of the Superstorm Sandy fifth anniversary week of action, 350Brooklyn and Brooklyn College Urban Sustainability Program are hosting a Town Hall on climate change on October 24, and we need your help. 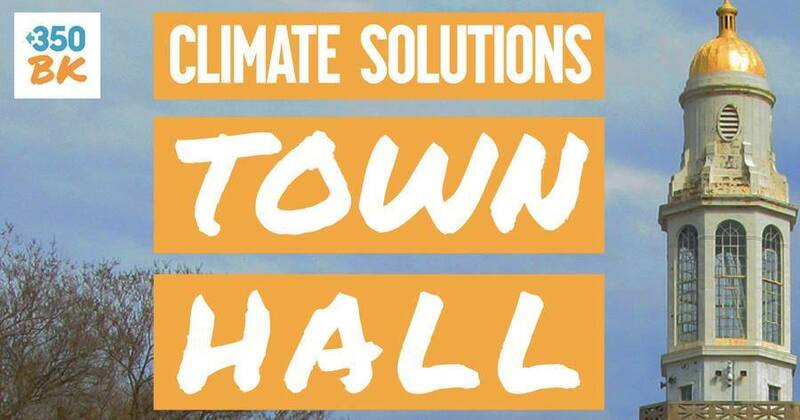 The Climate Solutions Town Hall is an important opportunity to demand that our state legislators provide meaningful leadership and take aggressive measures to address the crisis of global warming. Our panel includes representatives from New York Renews, the New York City Environmental Justice Alliance, Turn the Tide and Sean Sweeney, Director of the CUNY International Program for Labor, Climate and Environment. All State Senators and Assembly Members representing Brooklyn are invited, and we look forward to engaging them in this critical conversation. As Trump succeeds daily in his war on the environment–dismantling regulations that safeguard the land, water and air, protecting the fossil fuel industry and accelerating climate change–states must take action and our representatives must be held accountable. Attend the event. It’s free, but you need a ticket so get yours now. Bring a friend to the event. A personal invitation is the most effective. Share the announcement on Facebook and other social media. Contact the outreach committee (outreach@350brooklyn.org) and volunteer to help hand out flyers spread the word. Help us urge our elected officials to build resiliency in our communities, and make New York a global leader in the fight against climate change. On the 5th Anniversary of Hurricane Sandy, we put our state politicians on notice: engage for change!